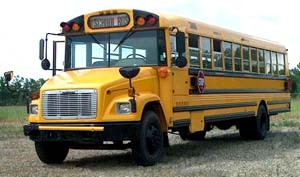 Need help finding parts for your Freightliner school buses? We'll help you get the "right parts" the first time. a major supplier of Type C chassis. such as Blue Bird, Carpenter, and Thomas. In 1998, Freightliner purchased Thomas and discontinued chassis sales to other body builders. We can help you find the parts you need if you can supply body serial number and VIN information. Type C Freightliner with the old style Thomas conventional body. The FS-65 model chassis and old style body were phased out in 2006. 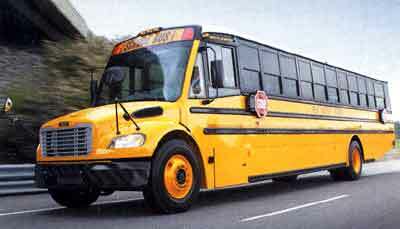 "C2" conventional bus featuring a complete redesign of the body and an integration with the Freightliner chassis. Thomas built both old and new style conventional bodies.